Discussion in 'Confirmed Event Discussion' started by HypnoHooves, 12 November 2017. Welcome to the First Aniversary of the Preston MLP meet, and just in time for Heath's Warming Eve. Every local pony is welcome to this gathering of the Lancashire herd in Preston - but we know many of you travel hundreds of miles for these preston events. Our venue to Dice and Donut's a local gaming cafe that serves coffee, donuts, toasties and beer to the gaming crowd. We have a reserved bank of tables- ok to be honest most of the ground floor. for what will no doubt be a large and friendly gathering. 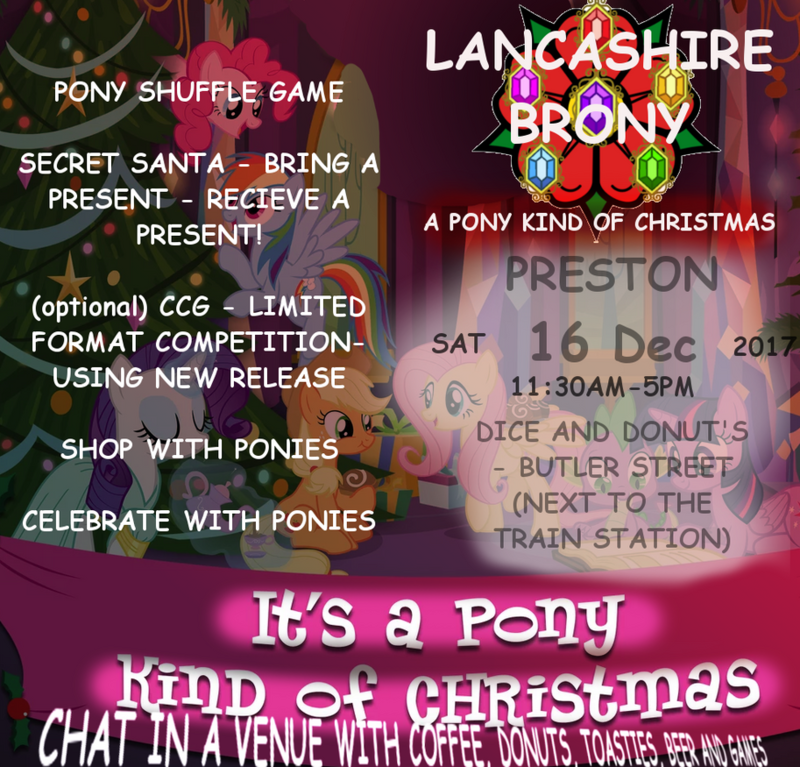 15:00 to visit some pony merch in preston for pressies, or remain at dice and donuts for those all shopped out! Bring a present and receive a present!. Those who want to can bring a small wrapped present suitable for a MLP fan to swap. £5 to £10 is the suggested value. (If you are short of ideas argos next to the venue has blindbags as £2 and ponies for 5). Bring your plushes, see if they can enjoy being part of the celebrations! Sorry. Doing summit else. Have fun! sorry to hear it...unless it is something AWESOME you are doing of course! Virgin trains have a number of special fares on. £33 day return from glasgow/edinburgh etc. so check them out,..if you want the train to take the strain! Hello! I will be there all going well. How will your Secret Santa work? Are we getting gifts for specific ponies or just selecting randomly on the day? Should be awesome anyway. As @CrikeyoRilley will tell you, choice is a tricky thing. Will have to see how I am money wise, but fingers crossed I should be ok.
Do you guys mind if I tag along to this? I'm Cumbrian, but it's only about an hour away for me! The meet is next weekend! wow time moves fast!. hope you all up to coming, had a few long distance confirmations on facebook, telegram etc. Good for coming, got secret santa gift wrapped. Can't wait. Me and Zikky will be there. Hopefully bringing over a Danish Pony who is visiting. Shall try to be there for the 11.30, traffic dependant as will be driving this month. Hope every pony is ready for 2moro! i cant wait. we got events planned! Remember ponies bring a wrapped gift for the secret santa! keep the price lowish in the £5 to £10 range. I have a few suprises awaiting you all! for ponies driving. 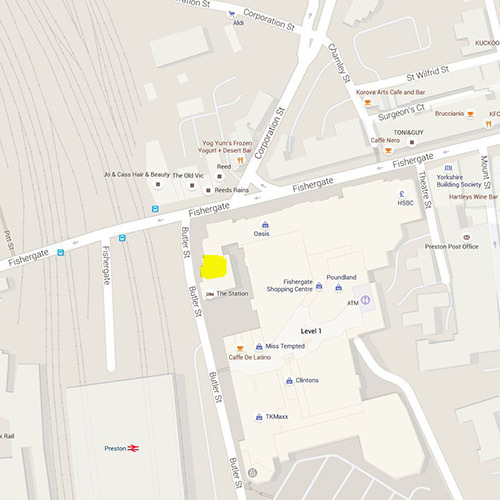 note the market stree tcarpark is cheap in preston, along with the christian road one. Also if you park in the butler street carparks (station or fishergate) you need to exit left - as fines are inplace for cars going right. Also if you park in the butler street carparks (station or fishergate) you need to exit left - as fines are inplace for cars going right. Don't forget the priorities have changed, traffic down Fishergate and Corporation Street now gives way to Butler Street (this is supposedly to avoid excessive delays to rail replacement buses). Wish I saw this sooner. Corporation street was a nightmare!